Manufacturer of a wide range of products which include profile projector. We offer a wide range of Profile Projectors to suit every need and budget. Optomech Profile Projectors come in three different types i.e., vertical projection tabletop and floor models, horizontal projection models. Standard models come with wider screen diameters. However, Optomech has supplied projectors screen diameters against special requirements. All Projectors are supplied with high resolution, low distortion telecentric lenses. The X, Y measuring stages incorporate the unique screwless design with zero backlash and quick release facility. Optomech offers a choice of illumination systems i.e. collimated beam condensed light of fiber-optic cold light source. 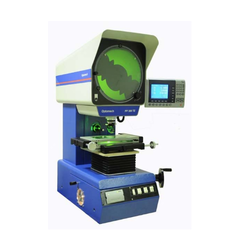 A variety of measuring systems from plain 2 axes DRO to 3 Axis microprocessor based geometric function DRO and advanced computerized measuring system with Graphical User Interface and capability to do reverse engineering.